Mary Mullineux, painter, printmaker, and educator was born in Germantown, Pennsylvania in 1875. She attended the Pennsylvania Academy of Fine Arts between 1894 and 1900 and later from 1906 to 1908. She studied with Hugh Breckenridge, William Merritt Chase, Cecilia Beaux and Henry McCarter and was elected to fellowship there. Germantown would remain her base where she set up her studio and taught. She was active with Howard Pyle and his circle in Wilmington, Delaware and was a member of the artist colony at Rehoboth Beach in Delaware. In 1926, Mullineux studied at Hugh Breckenridge’s summer school at Cape Ann, Massachusetts. 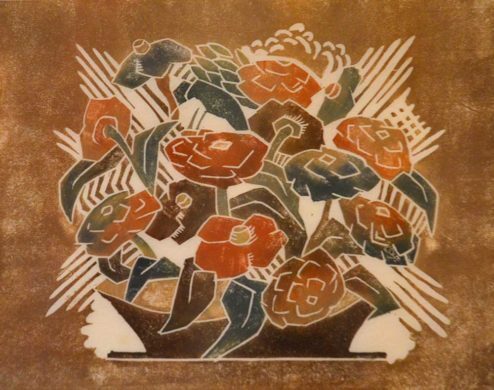 During summers in Provincetown, Blanche Lazzell offered a course on woodblock carving and printing and, according to Janet Flint in Provincetown Printers A Woodcut Tradition, Mullineux studied with her but the year was not given. Mullineux was a member of the Philadelphia Print Club, the Plastic Club and, in 1939, was a cofounder of the American Color Print Society, which is also in Philadelphia. She served its secretary and honorary president. In 1949, Mullineux was voted an Honorary Life Member of the Rehoboth League. ‘A Crowded Beach’ is in the Smithsonian American Art Museum with the title Blue Beach.